Long life span. 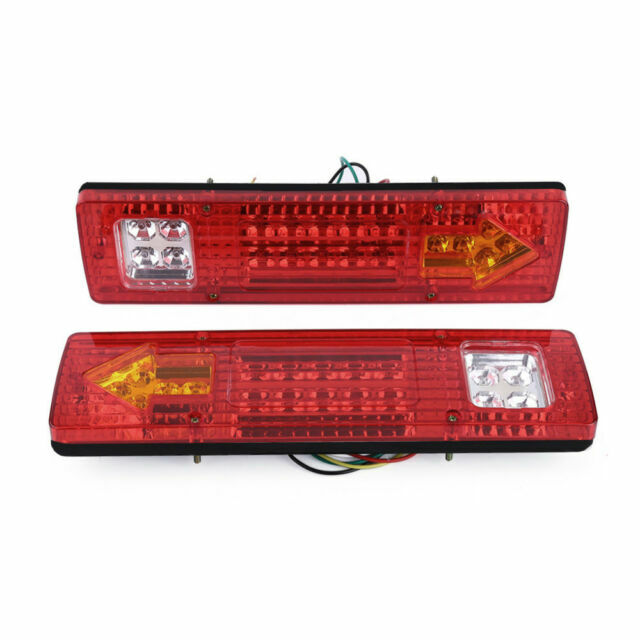 1 pair LED Rear Tail Lights. 12V fast responding bright LEDS with high output. Stop and Tail - 10 x LED. Reverse - 4 x LED. Cable exits : BLACK-NEGATIVE / BLUE - TAIL / RED - STOP / YELLOW - INDICATOR. Needed replacement for a broken rear light. This one was almost identical to original and much cheaper than original Kubato. Had to drill two new holes but they look and work fine. Wiring diagram would have helped but not hard to work out. They flash quicker because they use do much less energy than original bulbs, but that’s ok.
Not quite as bright as conventional bulbs, appears well made. Not quite as bright as I may have expected but seems well made and is more compact than the old one I replaced it with, time will tell how long the leds last. Bought these light units as I'm changing over to LED lighting on my trailer, found it was excellent quality,well made ,very good price , would highly recommend this product . Good for the price. No wiring details, but found online. Not used enough to give definitive opinion.